Dr. John Lewis is an emergency radiologist. He is specialized in providing optimal patient care in acute settings including in emergency departments, urgent care clinics and inpatient hospitals. Dr. Lewis is committed to quality in radiologic interpretation in the timely care of patients. Dr. Lewis earned his Bachelor’s degree in Biochemistry at the University of California-Davis. He received his Master’s degree in Medical Imaging Sciences and medical degree at the Chicago Medical School. 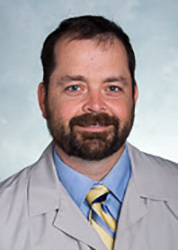 Dr. Lewis completed his internship at Mercy Hospital of Pittsburgh, PA and diagnostic radiology residency at University of Pittsburgh Medical Center, where he served as chief resident. He is also fellowship trained in Neuroradiology at McGaw Medical Center of Northwestern University in Chicago. Dr Lewis is a member of the American College Of Radiology, RSNA, and the American College or Emergency Radiology. He is board certified by the American Board of Radiology.